Hate it or love it, it's art. A beautiful creation. Although it is in limited release and hard to find in cinemas, this is a film that needs to be experienced on the big screen. Terrence Malick’s The Tree of Life is his 5th film in 40 years, and like his other meditative and ponderous masterpieces (The Thin Red Line and The New World), this one requires your full attention. Not because it’s hard to understand, but because it’s most effective when you allow the film to envelop you. To let your mind run free amongst the frames of the beautiful images and music presented to you. 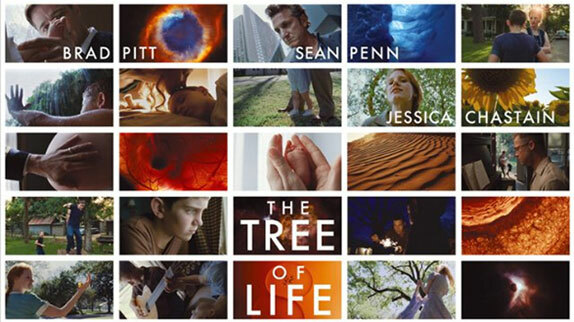 The Tree of Life is a slowly paced film about a grown man (Sean Penn) who begins to reflect upon his childhood after the anniversary of his brother’s death. The scenes involving Penn are merely the bookends and the bulk of the film are the memories he has of his upbringing in a nondescript 1950s American home. These are the scenes that are most effective as we experience his views of his strict but respectful father (Brad Pitt), his loving mother, his playtime with brothers and friends and his dissecting of life’s questions and values. Yes it sounds pretentious and tediously boring. I can guarantee there are many who see it as so (I had about 10 people walk out of my theatre about 30 mins in). But rather than it coming off as preachy, I felt that the naturalistic approach to the filming and acting allowed for it to speak with innocence. The child actors in particular are authentic, well..children. You believe everything they say or do; every mannerism. Malick’s typical camera movements and photography project a sense of documentary feel to the film. Mere glimpses of moments evoke a true sense of the memories. The most controversial moments (when people got up and left) where the documentary BBC Planet Earth moments. There are a couple of parts (some lasting for 15 minutes), when we are just watching nature exist. Whether it’s the flora in our backyard, the solar system expanding or the evolution of life in prehistoric times. In these moments, there is virtually no dialogue, only beautiful classical music sprinkled with a sentence or two of a character’s thoughts. These sequences are what allows this film to be compared to 2001: A Space Odyssey. Extended moments with beautiful imagery allowing for your mind to wander and think about the themes being presented. Summary: This film is long and requires your receptiveness and patience. The Tree of Life is not mind-blowing, but mind-encouraging; it gives you time to sit back and think. The naturalistic approach makes the memories seem like they are your own, as if you are experiencing your own past. There are many themes at work here and you have time to meditate on them all. This is a film that demonstrates how movies can be art, and much like art, you will either hate it or love it. A good film is one that allows you to be a part the experience and become lost within the presentation; it should inspire you to think. It will probably rise with another viewing, but for now this is my #179th favourite movie [on flickchart.com].